Today is my Blog's third birthday! Happy Birthday Sweetooth! 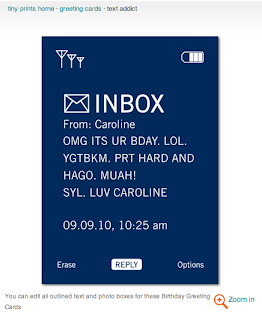 Threee years ago I didn't know what a blog was, or what I would use it for. I joined a Plen Air Painting club with my old coworker Tony Papini. 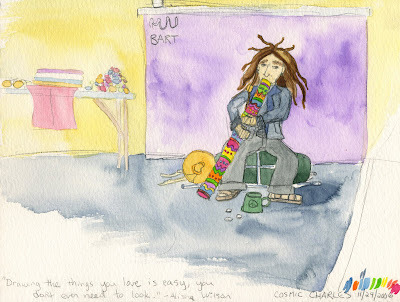 We would go all around San Francisco and sit outside and paint the scenes. I even went off on my own and painted Tahoe, and Santa Barbra. Tony told me about his blog and insisted that I needed one as well. So, I signed up on blogger and shazam I had a blog. It started out as a place to post my paintings and other random happenings about work and what not, with no major focus. This year however my blog has gotten a facelift, a new name and some major goals. 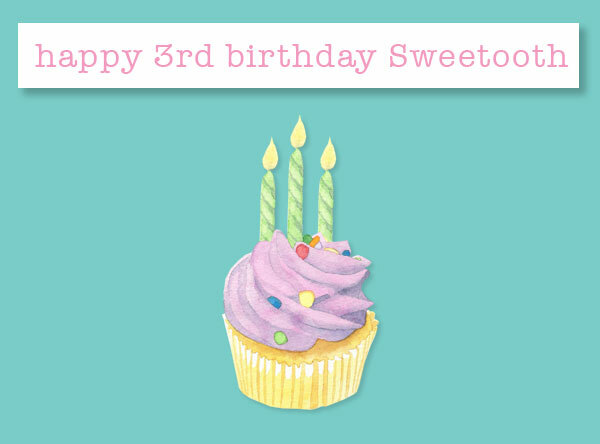 I decided that my blog is going to be a portal for me to get my art into the world and start building an awareness around my art licensing brand Sweetooth Studios. So I named it Sweetooth, and am now focusing on all things sweet as sugar. A lot of art licensing companies are more and more aware of your online followings (ie bolg hits, web sites, and your twitter following @AlishaWilson). When I was working with Flip Video the artists with followings were making a lot more sales then those without. I took a class called Blogging Your Way and it really took things to the next level for me. I recommend it for anyone who has a blog but doesn't know why they have one. Tony has always been an inspiration to me he is a driven painter and practly lives in his art studio when he is not working his full time job. When we were working together about a year ago Tony told me that he was going to do a 4" X 6" painting every day for an entire year. I was impressed and interested to see if this Julie and Julia type of expearment would actually be accomplished. 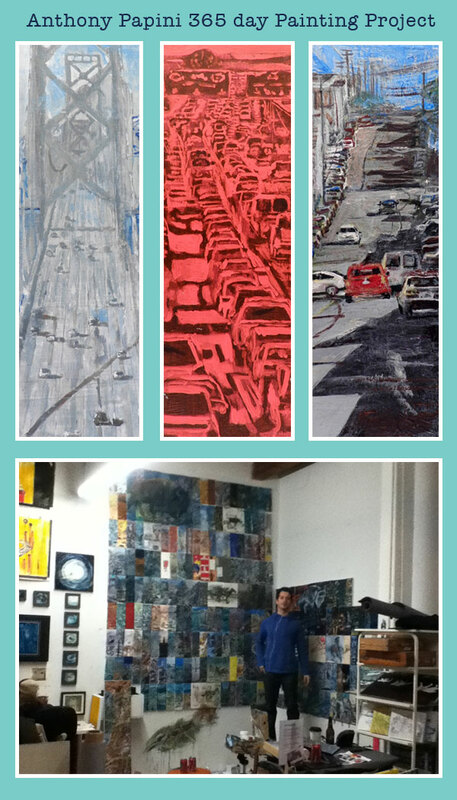 A year later, including a break up, a move, and working a full time job, Tony has finished 365 paintings in 365 days. Impressive. I am amazed and inspired at this accomplishment. I work a lot, and I always feel like I could be doing more, expecially when I see a project of this magnatude compleated. So I wanted to thank Tony for being such a driven person and inspiring me to blog about my work. Bon Job! Shop 'till You Drop Sunday - Red Sox Gear! I'm a big Boston Red Sox fan. I played on the Red Sox softball team when I was in fifth grade and that's where it all started. I was taking a look at the Victoria's Secret web site the other day to discover that they are now selling MLB gear! While working at Flip we were dealing with major licensing brands such as the NHL, NBA, and MLB. These licensing contracts are way more complicated then dealing with smaller licensing brands. They require more reporting and stricter rules. So I'm glad VS was able to work this out and offer some cute MLB gear that actually fits women. I went to collage in Boston Massachusetts and my love affaire with the Red Sox continued. I went to many games at Fenway Park and lived just down the street. in 2005 I was lucky enough to see the Red Sox win the world series! A few friends and I pounded an entire bottle of Dom Perignon to celebrate. I still watch the Red Sox every time they play the A's in Oakland, CA. Sometimes they play the San Francisco Giants and that is awesome because I live very close to the ball park. I love baseball and VS and when combined it equals a home-run in my book. I am taking a trip to Las Vegas and Colorado starting next Monday. I will spend the first three days in Vegas for a friends bachelorette party and the rest of the time in Colorado visiting my brother who just had a baby girl six weeks ago, her name is River Wilson. My mom is staying in Colorado to spend time with the new baby and enjoy some nature. I am so excited to see the new addition to my family. River is my fifth niece or nephew. I was gathering my travel painting supplies and I grabbed one of my many watercolor sketch books and found this painting I did of my brother in 2006. Charlie has been traveling around the world going to music festivals and Rainbow Gatherings until recently. It always amazes me how different all of my brothers and sisters are (all four of us). We do have one thing in common, we are all creative and were raised in a very accepting environment that fostered whatever it was we wanted to become. I am truly thankful that my parents let me be what I always have been, and supported me through all of my crazy art projects, art school, and beyond. Happy Friday and I actually mean that. 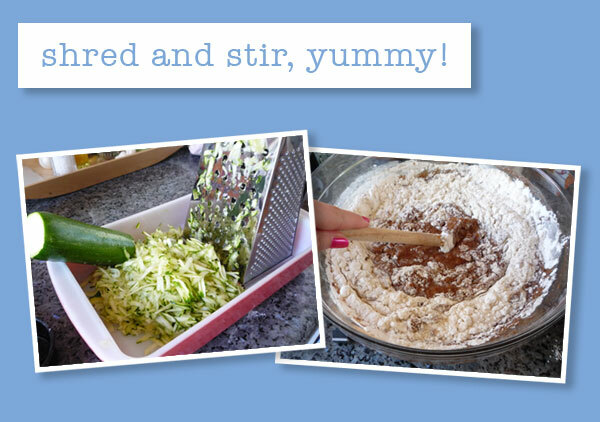 I tried this recipe so I would have some yummy bread to go with my morning tea. It turned out really good. I found this recipe in Gluten-free & Wheat-free Gourmet Deserts, and it makes one loaf of bread. 1 Place sugar, oil and eggs into mixer and mix thoroughly. 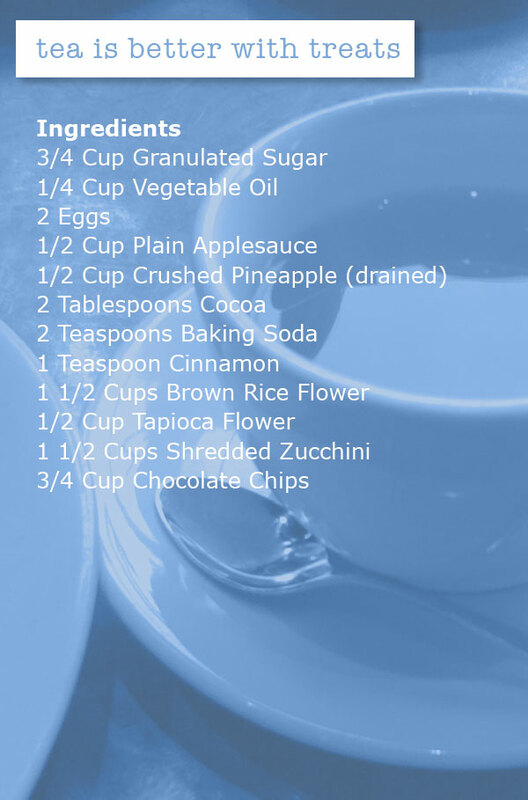 2 Add applesauce, pineapple, cocoa, baking soda, and cinnamon and mix. 3 Add flowers and mix until even consistency. 5 Grease one standard sized (9x5') loaf pan. Place all batter in this pan. 6 Bake for 55–60 minutes at 375 degrees. 7 remove from oven and cool before eating. I got my iPhone 4 months ago. I'm pretty rough on my iPhone and I drop it all the time so it needs to be protected. My phone came with a free case from (*)speck. This case has chipped pealed and fallen apart in every sense of the word. Right now my iPhone is a sticky pealing mess. I'm scared that if I take the case off I will end up breaking it. My mission today was to order a new case for my iPhone 4. I have done a lot of research on custom cases and skins because while working at Flip Video we were doing a lot of the same customization for the Flip video cameras. In all of my research I liked the company Uncommon the best. They have the best selection of artwork to choose from. Uncommon's website is well designed which says a lot for how the rest of the user experience will go. 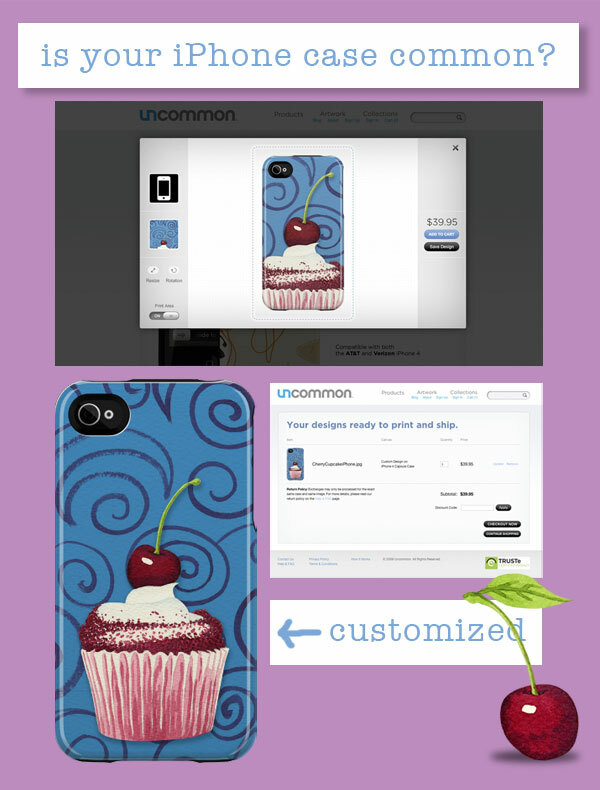 I was pleasantly surprised at how easy it was to upload my jpeg to their site and order my case. I opted to use my own artwork instead of pick from their image library. I figured as an artist I could use it as a way to show people what I was working on. I hope this case works out better then the last one, and it should because all told I paid $50 for it. A fellow artist recently asked me if there was and danger in showing all of your art licensing collections. This, like everything, is very personal for each artist. If you show every scrap of your art work, it unveils some of the mystery of your work, and it also opens you up to copy cats. If you hide and password protect your work, no one sees it and it can be a hassle for art buyers to remember your password and have to sign in every time they want to browse your designs. For me personally I share everything because I'm trying to make a name for myself and get my art out into the world. My feeling is that if someone copies my work they have no originality of their own and will eventually run out of steam anyway. When I'm more well known I will probably not show everything. Cindy Ann Ganaden deals with this issue by password protecting her collections and just showing some teasers on her site: check it out! I think this is a good compromise because it gives people a good feeling of what her work looks like without bearing it all. 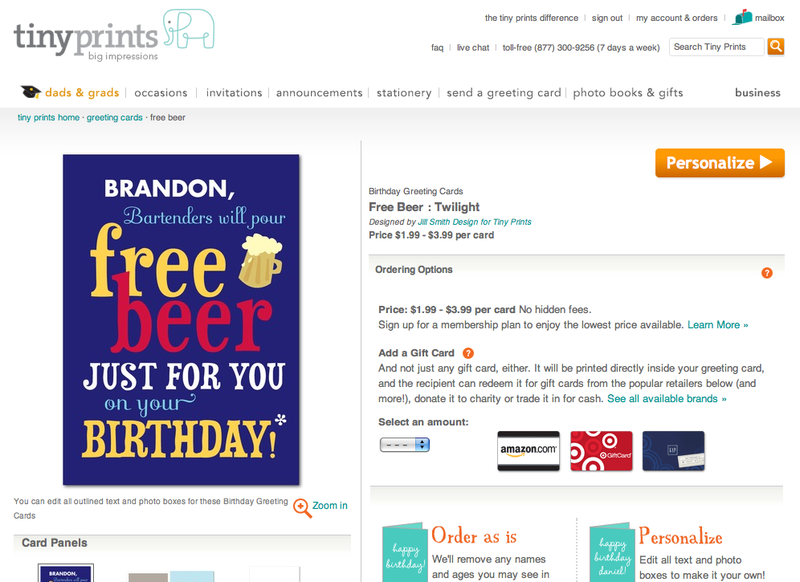 This Sunday I want to share with you an online greeting card company that I have been following for years, Tiny Prints. I recently applied for a job here and decided it was time to order some greeting cards from them to see what they were up to. I was amazed at how far TP has come. 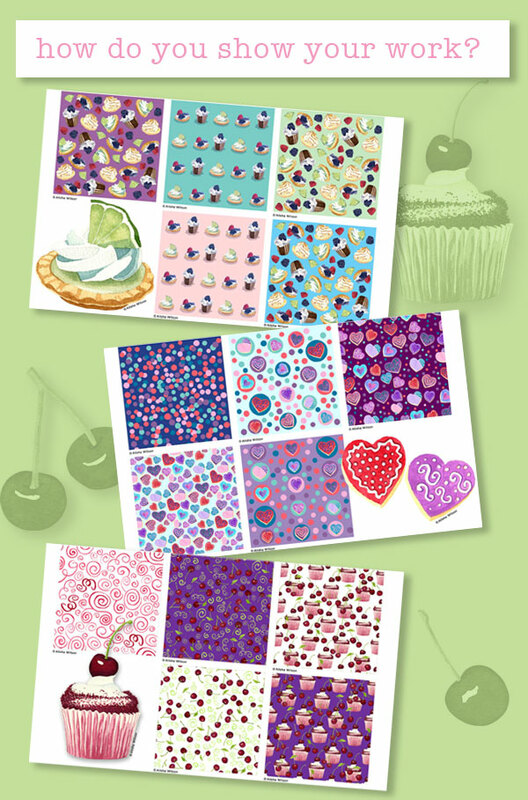 First off you can pick from many designs for greeting cards for all occasions and they are all customizable. 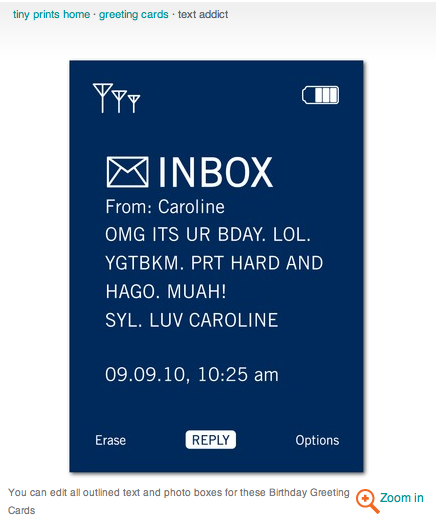 You can change the text and add pictures to make the whole card personalized. I live pretty far away from my family so I'm constantly sending cards and gifts and it's a pain in the (you know what). 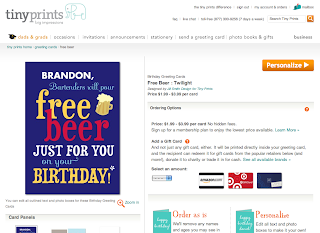 With Tiny Prints you can add a gift card to the card and shazam instant gift. When you check-out, you can have the card sent to you or the recipient, and you can schedule when the card is sent out so it arrives on time. This service has changes everything for me. I can buy cards for multiple people and be done with it. I am so excited to announce that Cindy Ann Ganaden's Flip video camera design was featured on Design Sponge for a Mother's Day Gift. This is the first blog I ever followed, and now work that I had a hand in is featured on there. Needless to say I'm grinning from ear to ear right now. I just got these wonderful pink Pumas. I needed some new sneakers for Zumba because my other sneakers were super old and they were starting to hurt me. These shoes are a designers dream. The attention to detail is awesome right down to the last stitch. The shoes are electric pink with hot blue soles, and green insides. I feel like a sneaker pimp and can't wait to go to Zumba class on Tuesday.